Condensation and precipitation defined the atmosphere at Kahana this weekend: sinewy cloud bands, roving showers, spontaneous low mists, dark bottomed squall clouds, towering cumulus castles. Over a dozen pilots came out over the weekend to surf the ethereal waves and avoid the occasional downpour, including some fun and unexpected additions to the regular Kahana weekend crew. On Saturday, Jeff scored an early trip to Pounders to avoid an incoming squall, after which I brought him back to hike up for his second flight. Steve flew the early session as well, and was proud to pull off his first toplanding. For the second shift we were joined by Nick, Czech Pete and Suicide (on his latest new toy), for some very interesting cloud surfing and many tantalizing bay crossing attempts. Doug came out later to fly a tandem with Matthew, and Alan H. stopped by for some kiting. At the end of the day we buzzed over to Kualoa to watch Reaper give new pilot Jared his last few training flights. 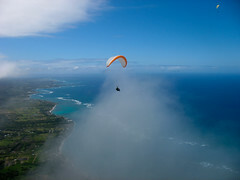 On Sunday, I made an early flight to Hauula to escape from a set of squalls that drenched Jim out of the air and soaked Steve as he waited on launch. Scrappy brought me back, and as Steve was landing his soggy aircraft, Scrappy and Hillbilly hiked up for a marathon cloud surfing session that lasted all afternoon, punctuated by occasional toplandings. Czech Pete and Arizona Chandler joined them, followed by Reaper, Mad Dog, and new pilot Jared who seemed to thoroughly enjoy his first high flight. Welcome to the club, Jared! Czech Pete took some amazing pictures of the misty scenery this weekend. I did my best to capture some of those cloudy vistas, but my old point-and-shoot camera just can't compare to the one that died in my recent bog landing. ya, fun weekend. thanks for the pics Alex, they look awesome, as usual ! !